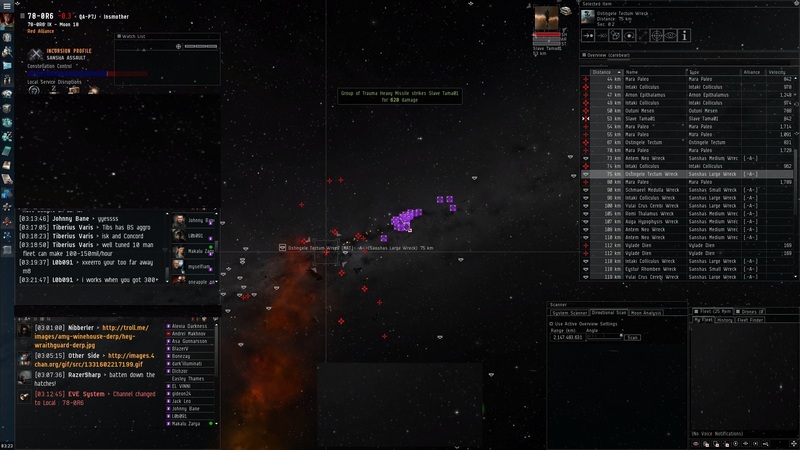 We have a joke in AAA that everyone in Eve, other than RA, has shown up recently to fight with us over C-J. An incursion in QA-P constellation, which contains C-J, was a great nuisance. Mostly because it cyno-jams every system in the constellation, but also because we kept hearing about En Garde members losing ships to gate-spawns. So, with little Incursion experience, we formed up 3-4 fleets of 10-20 people to clear out sites across the constellation. Within a few hours, we turned the bar completely blue, and a Sansha Mothership spawned. As we merged all of our fleets into one shield gang of around 70 people, we received continual trolling from 3-4 “expert incursion runners” in channel. They were sure we would die horribly. 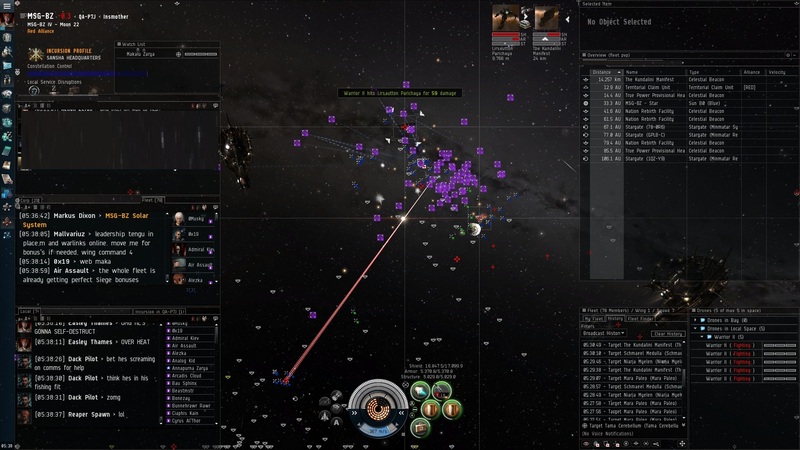 “This is much harder than a fleet battle with PL, Maka” the ex-NC care-bears proclaimed smugly. With no fear, we warped in and began working-down the spikey turd-shaped vessel. The only real plan we had was to kill the bombers as they spawned, and this worked well for us. We occasionally popped other NPCs, between bomber waves, but most of our DPS was on the Revenant. There were two deaths. One person did not broadcast, so he died slowly, and the other warped in a ship with only 1 LSE for his tank. The guy with 1 LSE did broadcast, but he was more-or-less alpha’d. In the end, we all got paid 90 million isk (each) in bounty plus some Concord LP. That’s 6.3 billion paid out to our gang for a 15 minute fight, plus whatever the Concord LP are worth. I can see why people run these so often! We had no clue what we were doing and I made 15 mil a tick from the Vanguard sites + 90 mil for the mother-ship. That said, I would really prefer NOT to have any more Incursions spawn on my doorstep anytime soon. This entry was posted on March 14, 2012 at 9:23 pm and is filed under Against All Authorities. You can follow any responses to this entry through the RSS 2.0 feed. You can leave a response, or trackback from your own site.